Game Of Sultans is a brand new empire building game for Android by Mechanistgames. Check out our Game Of Sultans guide, tips, cheats & strategy to rule like a king. If you have not played games like this, then you need to understand the game’s mechanics. And for starters, it could be difficult to understand the all the aspects of the game; how to play, where to start, how to build or manage! After the tutorial, you need to manually handle all kinds of activities in order to grow up. In this part, we will learn about the resources, soldiers, levy, heirs, consorts, Viziers, and much more. Make sure to pay attention to all the parts in order to understand every aspect of Game Of Sultans game. There are three resources that you need to play the game; gold, grain, and soldiers. Gold is used to upgrade the Viziers. Grain is used to recruit soldiers. And you send soldiers to attack enemies. You can collect these resources from the Imperial Parliament. In the Imperial Parliament, there would be two characters; Ahmelek and Hocas. Ahmelek assists you to collect Levy or resources; wealth, grain and soldiers. The player can gather these resources multiple times. If you want more, the level up Sultan. Hocas alerts you about the imperial affairs. You need to deal with these affairs. Just tap the character and on the next screen, you will have to make a choice; Yes OR No. Choosing yes will reward you in-game items such as the book, gold, and much more. If you choose NO, then you will earn experience(EXP Points, required to level up Sultan). How To Get Enhance Badge? To develop the Viziers, you need enhance badges. You can obtain these badges from the badge packs. On the main screen of the game, at the bottom, tap the backpack option -> head to the combine tab -> head to other tab -> tap the badge pack/first option -> combine the badge shards to get a badge pack. Once done, go to items tab -> badge pack -> use it to get enhance badge. How to get badge shards? Participate in the events to earn badge shards. In Game Of Sultans game, these consorts manage the private life of Sultan. You get first consort in the early stages of the game. If you want more consorts, then head to the Masquerade guide below to know more. A Sultan’s visit increases the intimacy and consort experience; after gaining enough experience or reaching a certain intimacy level, Consort will give birth to the babies or Heirs. Consorts titles is a new feature, it was added in the last patch. Here you can promote the consorts and receive more buffs. Unlock six consorts to unlock this feature. If you have not yet unlocked this feature and curious to know what is it, then check out our new post here(Consorts Titles: Everything you need to know). There is another option also; Random Visit. But this will not increase the intimacy points. So what is it? It increases the consort XP. Consort XP is used to increase the skill of Viziers. Do you know how heirs increase the empire’s strength? Which type of boost do you get? No? ⇒ Read Here. Do you know how consort helps you in the empire’s growth? No? ⇒ Read Here. Head to the masquerade -> at the bottom, you can check the fortune points. Tap the + button and use amulet item to increase these points. Increasing these points will increase the chances of interacting with a consort. You can obtain this item from the shop in exchange for gems. At the beginning of the game, you have only access to the campaign mode. In this mode, you battle against enemy castle’s king and capture their castles. As you progress or defeat more, Sultan gains experience. In the battle, soldiers attack the enemies automatically. It’s boring though. To win the battle, increase the soldiers; you can acquire soldiers from levy, by completing the quests. And to defeat the enemy king, you need to appoint a strong vizier. So make sure to increase the level or talent level of all the viziers. If you are out of soldiers, then you can use diamonds. Go to the store -> item store -> there would be an item named commander seal. This item grants 100K soldiers to the player. Once purchased, go to the main screen of the game -> tap the backpack option -> tap on the commander seal and use. Your Viziers can learn skills in the academy. All you need to do is head to the academy facility -> choose the Vizzier -> wait for a certain amount. That’s it. This will also increase the PvP level of these characters. You can learn about union, feasts, arena, and more in our advanced guide ⇒ Read Here. So this is the Game Of Sultans guide for the beginners. Now, let’s take a look at the Game Of Sultans tips, cheats & strategy to master the game. In Game Of Sultans, the main challenge is to grow the empire and get promoted to a new class; Young Sultan I -> II -> III -> IV ->V, then master, and grand. All you need to do is increase the level of Sultan. 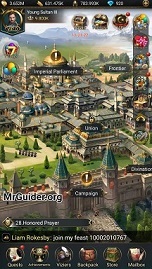 Sultan’s level determines the empire power, trade limit, recruit limit, levy limit, and affairs limit. By leveling up, you can increase the limit of these aspects and get access to new features+ progress fast. How to level up fast? There is only one way we would recommend you and that is to focus on the campaign mode. Defeat the enemies and earn XP. Many of us forget to use the items we get by completing the quest. Tap the backpack option on the main screen -> there you can see the list of items you have. Tap it to know what is it or use it. If you want to change the name in Game Of Sultans, then there would be an item named renaming card. Use it to change the name. Items like earing, rings are used to reward the consort in Harem. It increases its charm level. XP boosters, books are the items, used in increasing the attributes of Viziers. #3.) Random Visit Vs Visit; Which Is Better? On the main screen, on the right side, tap the lamp option. Light the lamp to get the reward. You get one oil drop every day that can be used to light the lamp. In Frontier facility, you can participate in events; hunting grounds. Basically, in this mode, Viziers hunt the animals and you earn gold, score points, and tokens. You can use those tokens to buy Vizier’s rings, clothes, hat, and attribute book/tome. As you know, Viziers help you in many ways. And their skills matter a lot. To level up the skill of Viziers, go to the academy -> choose the Vizier. In the last update, Game Of Sultans has added a free way to obtain diamonds. On the main screen, on the left side of the screen, tap the videos icon and watch the video. You can claim this offer 5 times a day and earn diamonds, precious items for free. Pirate Hunter is the new event in Game Of Sultans. In this event, you join a fleet and hunt the pirates. Head to pirate hunter event -> join a fleet. Tap the hunt now button. If you find a pirate ship, then tap the attack button. You can attack a ship once every certain amount of time. If the pirate ship’s power is very high, then hit the explore button again to search in new sea areas. You could also find pirate chests, drowning man. To open these chests, you need keys; complete the achievement to earn these keys. Most Important Tip: – Participate in the events for premium items such as feast tokens, chest keys, badge shards, and more. If you have any questions, then ask us in the comments. You get chests from hunting grounds as a random reward. It’s completely random. If you have not got it, you can still claim the rewards from the chests obtained by other players while hunting the animals. Head to the hunting ground screen(where you shoot animals) and at the bottom, tap the chat bar. There you will often see a message ” An X player found a chest during the hunt, hurry up! Tap the chest icon and claim the rewards. If it is already opened, then you will not get the reward. So always pay attention to the chat menu and claim the rewards before other players. From premium chests, you could obtain crystals. Can you tell me how and for what I use beads? What does it mean to enhance badges? @Raj To develop Viziers’ Talent(politics, military, research or more), you need these enhance badges. How do you get these badges for improvement? @Celina Participate in the events and collect badge shards. Combine these shards in the backpack menu to get badge pack. Open the badge pack(items tab) to get these badges(you get a random badge). I wasted a lot of time going through invite codes that weren’t on the same server. 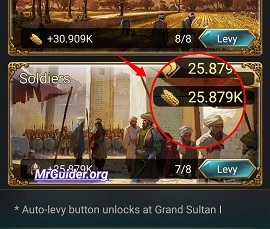 If you want some extra goodies, check your server # in your Sultan info, It’s in the account icon I think. Make sure to find people w the same server!! Then in the right top corner tap the present w balloons icon, then the middle invite one in that page.. You will see your invite code & get extra rewards the more people enter your #. I wanted to say this bc everyone was saying the code was under the Sultan’s avater, ughh. If you’re on the same server, come get your rewards!!! I keep getting assigned maids. Where do I find them? @Chris, you won’t see maids. Maids are used to increase the charm of consorts. The higher the charm of a consort, the more bonuses you get with her, and the faster you can promote her. I recommend focusing on one consort at a time to get her to the highest position possible. Hope that helps. I still can’t figure out what to do with the grain.. Can someone help? @Arti Grain is used in recruiting/levying soldiers. You can check the cost(grain required to recruit) on the soldier banner. How do I use the basic union chest and what does it do? How do you get Feast Clothes? when you go to your backpack then combine then other theres a picture of a sultan dress. How you get that? Also how you get the Gold Union Badge? It’s under combine and under in your bag pack too. Feast Clothes -> To get feast clothes, you need feast fabric. You can obtain this item from the events like hunting ground, pirates. However, we have not seen it yet. If you long press the item icon, it will show you the production source; event. So always pay attention to the events or the event rewards. Gold Union Badge – It’s a premium item. You may get it as a purchase bonus. Sultan or Vizier Dress? – You need these items to promote viziers. Material items can be acquired from the events; redeem event currency to get these items. Hi everyone, I am looking for information on leadership roles with in a union. What is the deputy leader and their role? Elite? Thank you!! What happens if I demote a consort ?? Do I get the earrings of charm and intimacy back? I have a question, how to complete task honored prayer? @Anonymous It’s pretty simple. On the main screen, if you swipe a little bit, you will find rankings option; Rankings(i). Tap that option -> server ranking -> that menu has three tabs; power/campaign/intimacy -> tap the honor button at the bottom-right corner. Honor button refreshes every 24-hours(after tapping, it will disable and re-enable next day). @Jzjz1212 In the union, players with these roles have special privileges. For example; if you are a leader/deputy/elite, you can set voyage. A leader can disband the union. The leader of the union can transfer ownership and promote the players. Sorry for the late reply! On master quest 142.. says uses challenge letter it takes me to areana. How do i use it there? @Dorothy It’s quite simple. Challenge letter is used to challenge Viziers in the arena. Head to the arena -> tap the arrow icon at the bottom-right corner -> there you can challenge the players. You can buy this letter from the store. Challenge Edict – You can use this item to raid Viziers. Tap the fight logs option on the arena screen-> go to the third tab, raid -> enter the ID -> raid. How do I change my avatar character to a consort? Tap the profile avatar icon at the top left corner-> choose account option-> tap the avatar again and choose a consort. How do you get Vizier Semi? I would like to know how the talents and attributes are calculated. By example on stage 5 in every campain or if you join a journey in the union there is a little feast with some battle points for each vizier… how are they calculated and how can I level up them? Then there are military skills or prestige skills political etc. But there are different from vizir to vizier… military such as seafight, swordfight, hunt, axe etc. Also prestige: what is for what? What has an effect to what? Like: if I open a sea journey in the union: which vizier should be leveld up to be best in that? Also union fights: which one of those and what is the best strategy as well as hunting or campaign? Vizier Attributes are; Military, Research, Political, and Prestige. 1. )Military – It is linked with the Vizier’s attack power. If you improve the military attribute and military talent, Vizier’s attack power will increase. 2.) Research – It is linked with the gold levy. If you improve it, then levy amount(for gold) will increase. It means you will get more gold from the Imperial Parliament. 3.) Political – It is linked with the grain levy. If you improve it, then levy amount(for grain) will increase. You collect the grain from Imperial Parliament. Improve this attribute to increase the levy amount. 4.) Prestige – It is linked with the soldiers. If you improve this attribute, then from the Imperial Parliament, soldiers levy amount will increase. I have a question; somebody admitted to me he’s a ‘cartoon’ player and have another account on the same server. Is it not cheating? How much skill level of consort, ex cecilia..
How do you use pve seals? You can use PvE seals in the frontier events. For example; In fortress siege, a Vizier can attack only once. If you want to use that Vizier again(change), you need this item. Similarly, you can get more attempts in hunting grounds, boss fights with the help of this item. You can get it in the item store. In the frontier area/hunting it always says “you don’t have enough tokens” and i have no idea where or how to get tokens. I am trying to dissolve my union but I do not know what is the password since I recovered the command of my union following the fact that my leader did not connect for 15 days. I want to leave my union because a more powerful union proposes me to integrate theirs. But I do not know where I can find this password. And I can not transfer the union because there is not enough money in the bank of the union. Could you tell me how to dissolve my union? @Illiana Bourreau You will have to contact the support team for the password. They will provide you. To contact the support team, tap the profile avatar at the upper left corner, then tap the support button and then on that screen at the upper right corner, tap the contact us option. How do I raise the VIP? Do I have to buy something or …? For VIP, you will have to spend real money! When you buy diamonds, you get the VIP points. For example; to activate VIP I, you need 499 VIP Points. Hi, two questions: 1. was wondering how and when to use the support scrolls you can buy for Union Wars? I bought some and they sit in the bag but I can’t figure out how to use them. 2. What are tribute seals for? Thanks in advance! @Faraj You can use the scrolls at the time of registeration) -> on the formation screen, at the top right corner of Vizier banner, there would be a scroll icon. Tap it and use the scroll(vanguard or garrison); when? In the last rounds or depending on your union strategy(ask leader). Tribute seal – You can use this seal in imperial council. Swipe a bit on the main screen and find that building. Tap it, then tap the envoy. It’s free for the first time. To claim rewards again justafter the first attempt, it will prompt you to use tribute seals. What happens when it says viziers have been killed or exterminated in the Arena? Would I lose that Vezier forever? @Kate Finn Nope, you will not lose it forever. It just like a defeat in the battle, nothing more. What influences the health of your visors in arena? @Chino, when you said health in arena, I assumed you are referring to vizier’s power/attribute. This is the attribute that adds up to your total empire power. The attribute for each vizier is calculated by adding military, research, prestige and political power. In other words, improve on the 4 areas for viziers, your viziers will be stronger in arena. That being said, improving vizier PvP skills can also influence arena success. PvP skills can either be improved by studying in imperial academy or using the purple Skill XP book. Hi, I’ve just created a union after leaving me old one. I have a lot of people wanting to join my new union but I can’t find an option where I can send them a request to join. Please help? Also typing in my player ID seems to show nothing. What is the function of Tribute Chance? In pirates hunting we use fruit so if I don’t use it and save for next pirates event. Is it possible that the fruits will not be vanish? How many VIP points do you need to reach levels 3 and 4, respectively? @Rachel You can use tribute seals in Imperial Council. Tap the envoy -> get the reward(first time, it would be free) -> tap again and use tribute seal. Can I access a “Scroll pack” to use badges even if I am not in any Unions? 2fkb9s46x5swu invitation code server Europe s48. Hi. I simply cannot figure how to set a union voyage. Can you help me? Do I have to keep on spending money in game to maintain the VIP status or is it permanent? How do I use the garrison and vanguard scrolls in Union war? I have a lot and need to know how to use them. Is there a way to continue play without joining a union. I’m stuck on the first union quest and prefer solo play. Suggestions? I build a union, strong one. Just 2 people with “VIP” but still can reach 4th-5th place. But lately i was so busy. I want to give my position as a leader to my friend. And the problem is, i myself didnt know the “password” of the union. I never set a password, so i couldnt find it. Anyone can help me with that “password”? What makes up the vizier power in hunting or union voyages? The number is different from attributes, so I want to know how that’s calculated. VIP 2 is actually 1999, not 999. Each VIP point represents $.01 spent on upgrades. So if you see someone who is VIP 10 or higher this means they have spent over $20k on a free to play game. I will leave the interpretation of such things to the alert reader. How do I use the orange gems I get during the pirate hunt? It is not related to the fortune in the masquerade like I have read on other pages. Help. Hiya! In Pirate Hunter, what are the orange jewels/crystals gathered? What are these used for? What’s the best pattern or order to do things to get the most out of them? When you do the daily achievements should you only do what is asked for like campaign is 0/16 should I only do 16? Can Deputy leader and Elite accept new members application into a Union? Also, my elite are only able to start a voyage using gems, why can they not use the Union tokens? How do I earn marriage rings? How to increase attributes, faster…. Best way to get lot of attributes, books and level up…. Level up I can do how it get more books?? I’ve been part of a union for ages now & always contribute. For some reason, the game is telling me I have reached my contribution limit, so it won’t let me contribute any amount. I don’t understand what this means, can someone tell me please? Is there anywhere a list of all main quests Fe. 329. Achvie lv52 in Campaign? 1. What is the use of Millionaire Title – How does it help a player? 2. What is the use of Celebration Clothes – Any special benefits for the player? When you’ve taken over as leader of a union it prompts you to set a new password, you don’t need any old passwords someone else set! I know cos I’ve just taken 1 over! Don’t think your question was answered so I will try. You should just continue to play the game as much as possible and not worry about stopping when you reach the number for a Quest, etc. I believe your scenario is that your next Quest asks you to reach Level 16 on Campaigns? and you are currently at “0” since it shows 0/16. Right? So you continue to work on the campaigns and reach level 16. Do you stop playing the campaigns or wait until you are given another directive, like reaching level 20. Answer: By all means continue to play, completing as many Quests as you can each day. In fact, you should do that for all categories. By completing Quests, visiting your Consorts, upgrading your Viziers, etc. you will have situations where you will be able to get multiple credits and awards some days, especially if you have just started playing the game. I have been playing for many months and I am STILL finding things I don’t know. It is a complicated, but fun game! What does “Boost” do? It randomly pops up when I’m tasking. Such as a random visit or leveling up a vizier.